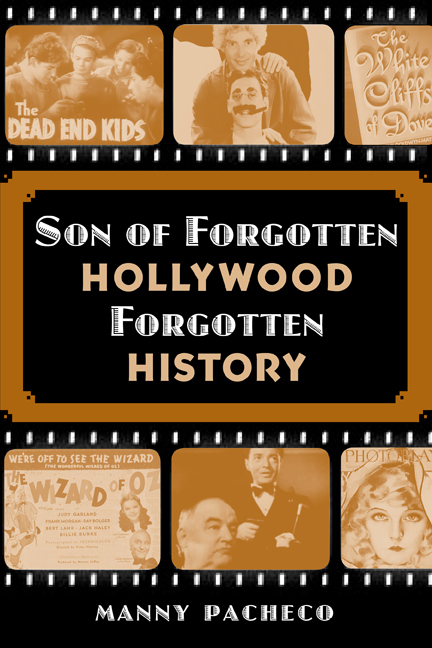 “Forgotten Hollywood”- New Work Promoted to Bookstores! 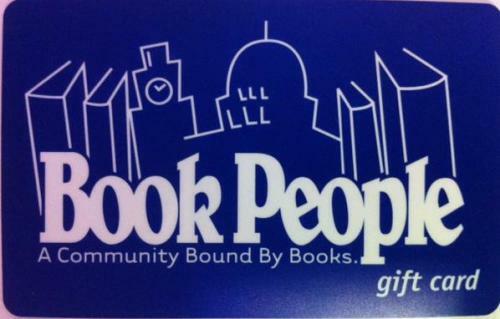 As the BOOK PEOPLE website explains: They are an Austin, Texas community bound by books. 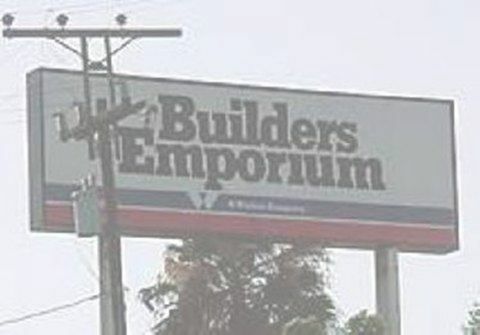 They also carry Forgotten Hollywood Forgotten History (the 98th on demand store). This literary shop is located at 603 N. Lamar in the heart of a major college town. Thanks to Guy Magar from ACTION/CUT Filmmaking and author of the book Kiss Me Quick, Before I Shoot for linking my blog to his site. 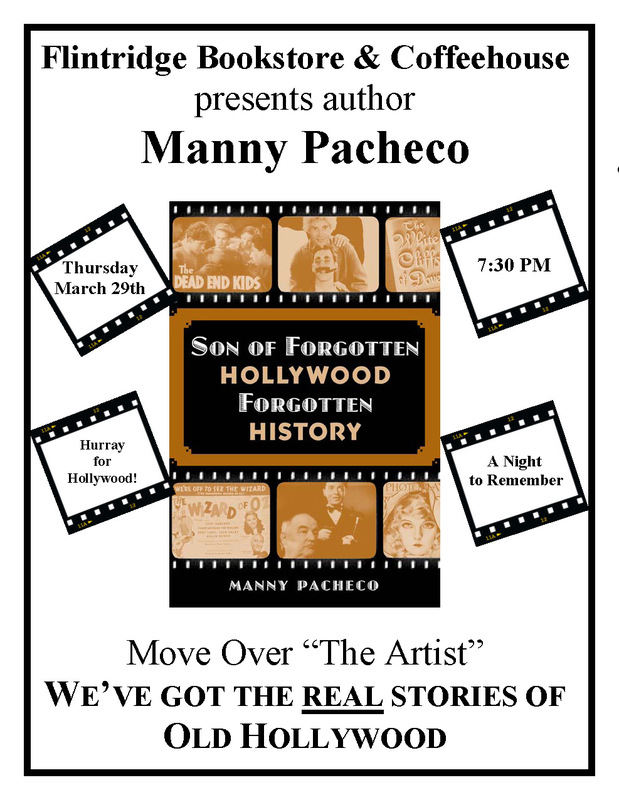 I’m making a return trip to the Flintridge Bookstore and Coffeeshop as part of my 2012 Spring Tour promoting my new book – Son of Forgotten Hollywood Forgotten History. It’s taking place on Thursday, March 29th at 7:30p. 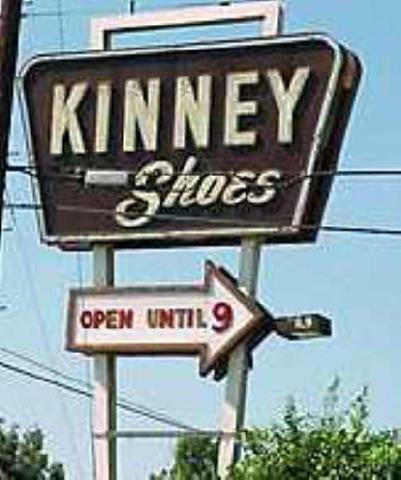 An event at this location was a highlight of my 2011 Book Tour the last time I visited this remarkable shop. I’m personally inviting you to stop by and pick up a copy of my new paperback, particularly if you live near La Canada, Glendale, Pasadena, Eaglerock, Los Feliz, and Hollywood. The Academy of Motion Picture Arts and Sciences has expressed displeasure over the expected auction of 18 Oscars awarded through 1947. Nate D. Sanders Fine Autographs and Memorabilia will be consigning the golden statuettes. A winner’s agreement was put in place by the Academy banning the sale of Oscars given out after 1950, which means the film guild cannot legally stop the proposed public purchases. Awards from the films include Cavalcade, Skippy, Citizen Kane, Wuthering Heights, Going My Way, The Yearling, How Green was My Valley, The Best Years of Our Lives, The More the Merrier, and A Double Life. These included Picture, Actor (Ronald Colman), Color Art Direction, Original Screenplay, Black & White / Color Cinematography, Director, Film Editing, Supporting Actor (Charles Coburn), and Music. The Academy bidding begins Tuesday at 5:15p (pst). * SAN FRANCISCO PUBLIC LIBRARY SYSTEM – 16 locations of these 28 branches throughout The City By The Bay have requested one or both in the Forgotten Hollywood series. When each receive the paperback, this library system will be the #1 public literary facility carrying the most number (23 copies) of my own work on their shelves. 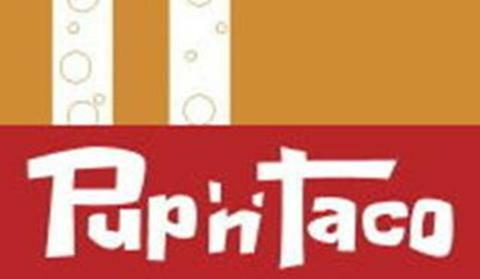 * PHOENIX PUBLIC LIBRARY – Burton Barr Central Branch will be adding both paperbacks to their shelves. This is Arizona’s participation in bringing America’s story through the eyes of actors from Hollywood’s Golden Age. This information confirms a total of 77 nationwide branches carrying my book series. Over the past two weeks, four library branches of Los Angeles County; and one Long Island, NY branch have added copies of my first paperback. The estate of Peter Falk is providing a scholarship fund to my alma mater. UCLA has established the Shera and Peter Falk – Lt. Columbo Memorial Scholarship Fund. A donation of $3 million to the university is expected to aid undergraduates studying music, folks with disabilities, and veterans of the military. The hefty sum was provided through a personal will created by the fine actor of film and television. The first award will go to five students entering UCLA this Fall. They’ll have their tuition covered for four years. Falk obtained a Master of Public Administration degree at the Maxwell School of Syracuse University in 1953. Falk was also an accomplished artist, and in 2006, he had an exhibition of his artwork at the Butler Institute of American Art. Peter Falk was the winner of four Emmys for playing the disheveled detective on a television anthology series on NBC. He previously received two Oscar Supporting Actor nods for roles in Murder Inc., and A Pocketful of Miracles. 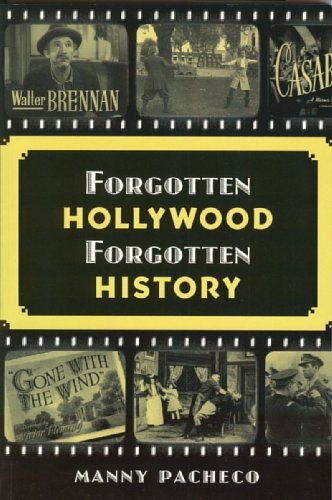 You can purchase a copy of Forgotten Hollywood Forgotten History at the UCLA Store Bookzone. An additional paperback is housed in the prestigious shelves of the UCLA Arts Libraries and Collections. As a Bruin alumnus, I’m pleased over the enduring legacy in the field of education placed in the name of the late Peter Falk. BIGGER THAN LIFE Hollywood’s First 100 Years explores one of the most fascinating cultural phenomena of the twentieth century, and looks at the well-known milestones in film history, and sets them in the context of the Jewish European experience… specifically themes such as directly addressing the anti-Semitic theory of a Jewish-controlled Hollywood by showing that Hollywood was founded by Jewish immigrants from Europe. The exhibition shows how Hollywood interpreted historic events such as the arrival of Austrian and German refugees in the 1930s, the Golden Era of Hollywood. The program also investigates the various attempts by Hollywood and its producers to portray the inconceivable horrors of the Holocaust. BIGGER THAN LIFE is also devoted to more generalized phenomena such as the invention of the star system. 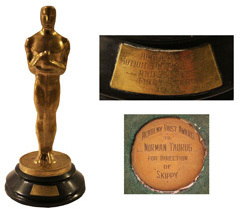 It shows key films, unseen billboards from the early days of cinema, and surprising items: Marilyn Monroe’s makeup case from Max Factor, the inventor of her platinum blonde hair; and Dorothy’s red shoes from The Wizard of Oz, the symbol of the power of imagination and the Hollywood happy ending. The exhibition continues until May 1st. It’s currently Europe’s finest tribute to classic cinema (in my opinion). In the Introduction of Son of Forgotten Hollywood Forgotten History, Gary Lycan, the newspaper columnist, and my co-host of our radio show that airs on The Spa Radio Network each Saturday at 3p (pst), references the late Ralph Story’s two 1990’s documentaries that ran on PBS during the 1990’s. 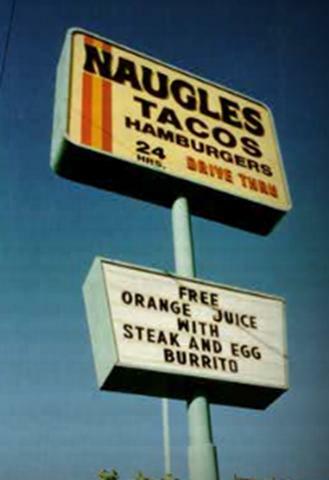 Things That Aren’t Here Anymore and More Things That Aren’t Here Anymore were fabulous pictorial representatives of a forgotten Los Angeles. Let me thank my radio colleague (and good friend) John Newton, for sending me some photos that might have made Ralph Story and Gary Lycan very proud. 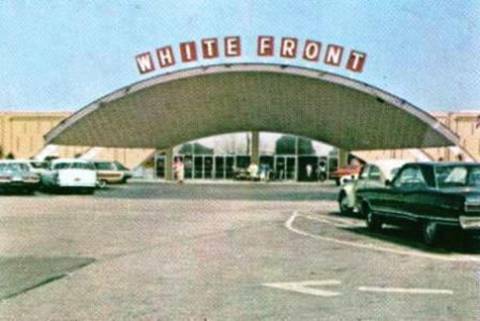 These trips down memory lane are fascinating if you were a consumer in the 1960’s and 1970’s. 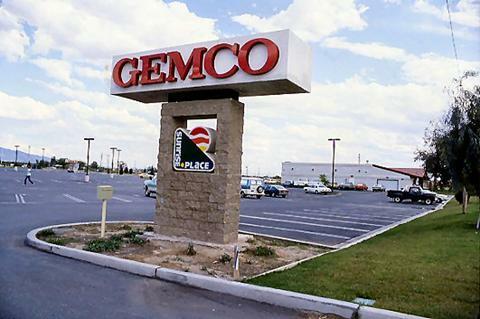 And particularly bittersweet… these locations don’t exist anymore. 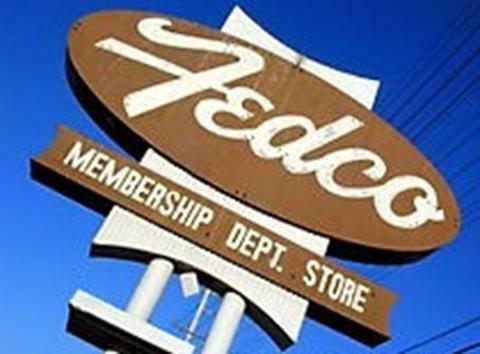 “Forgotten Hollywood”- 2012 Oscar Show Honors Film’s Past! This year’s Academy Awards ceremony will feature motion pictures paying homage to cinema’s fascinating legacy. Many of the top nominees offer interesting back-stories that I’m happy to share with you. * HUGO – Martin Scorsese is committed to movie restoration. His latest production takes us back to the origins of film during the Silent Era. 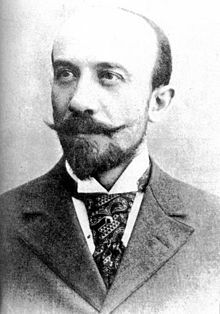 Georges Melies created innovative magic on screen during the first decade of the twentieth century. A Melies-renaissance took place just after the advent of sound in cinema. France’s Motion Picture Academy eventually restored much of the director’s work feared lost, which is why Scorsese desperately wanted to tell this compelling story. * MIDNIGHT IN PARIS – Here’s a Woody Allen comedic fantasy taking us back to a time during The City of Lights Lost Generation of the 1920’s. Among the artistic-elite featured: Cole Porter, Gertrude Stein, Salvador Dali, F. Scott Fitzgerald, Pablo Picasso, Ernest Hemingway, and Josephine Baker. The words, music, and visual art created by these avant garde intellectuals had a distinct impact on the origins of the Studio Era in film, including the use of art deco, jazz, and approved scripts based on A Farewell to Arms, For Whom the Bell Tolls and The Great Gatsby. * THE ARTIST – The transition of the silent era to talkies had a profound effect on the Hollywood community. It helped make stars of Greta Garbo, Joan Crawford, and Broadway actors as Humphrey Bogart, Spencer Tracy, and James Cagney. This fateful decision also ruined careers. 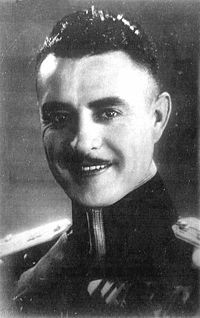 The most notable was John Gilbert, whose thin voice didn’t translate well to sound. Overnight, Gilbert became an alcoholic and prematurely died. This time in America is well-chronicled on celluloid, including in The Jazz Singer, two versions of A Star is Born, Singing in the Rain, and now, The Artist. 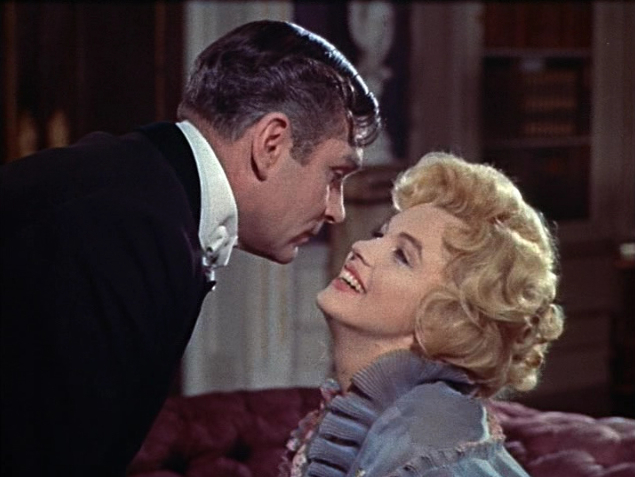 * MY WEEK WITH MARILYN – Postwar English cinema blossomed through the concerted efforts of Alec Guinness and Laurence Olivier. Legendary studios as Pinewood and Hammer brought into focus British comedy, drama, and horror into the 1950’s and 1960’s. This delightful movie provides a snapshot during a week when Marilyn Monroe desperately traveled to the United Kingdom to be considered a serious actor; while Olivier searched for surefire stardom. Neither succeeded, but the historic pairing in The Prince and the Showgirl had a lasting impression on both stars; as well as, on Vivien Leigh and Arthur Miller, their respective spouses at the time. There’s little doubt, Hollywood’s reverence to its past will continue, due to the interest of producers, directors, and actors from today’s era. Meanwhile, enjoy the Academy Awards show next weekend! “Forgotten Hollywood”- Tinker Tailor Soldier Spy… circa 2012! Secret papers released on Friday by the National Archives in London suggest Chaplin may not have been born a Brit on the day generally accepted as his birthday. After scouring the many files at Somerset House for his birth certificate, including checks for his supposed alias Israel Thornstein, British Intelligence concluded that the iconic star may not have been born in the United Kingdom. Investigations in France and Russia have also drawn similar conclusions. It seems no evidence exists as to where Charlie Chaplin was born. Rumors that he was a child of gypsys have proved similarly unfounded. This hypothesis has been fact checked… Really? 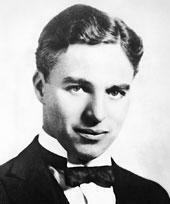 Because of the many mysteries surrounding Chaplin during his lifetime, he was finally knighted after a 20-year delay in March 1975. What is known… The United States banned the actor from entering the country in 1952. He was finally allowed to appear, decades later, at the Academy Awards to accept an honorary Oscar. “Forgotten Hollywood”- Life and Times of C. Aubrey Smith! One of the actors in my new book, Son of Forgotten Hollywood Forgotten History, is getting plenty of publicity. Though he died over sixty years ago, C. Aubrey Smith has just received wonderful attention from The Picture Show Man website. The eloquent thespian was primarily cast as drawing-room gentlemen, and as British officers in fine dramas. 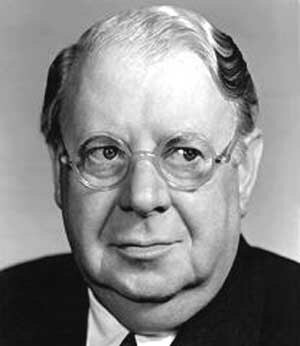 Smith was almost 70 when he emerged as a reliable supporting player in talkies. And, he relied on his stage expertise to deliver screen performances in Tarzan the Ape Man, The Lives of a Bengal Lancer, The Prisoner of Zenda, The Four Feathers, The White Cliffs of Dover, Rebecca, and others, over a two-decade career during Hollywood’s Golden Age. Throughout his life, Smith was a passionate lover of cricket. He even organized the British-Hollywood elite to form their own team in the United States. His personal and private life is well chronicled in the fine article from The Picture Show Man. Plus, you will love the rarely-seen photos related to the actor. “Forgotten Hollywood”- LA County Library System adds Book! This Southern California County Library System is now considering carrying the Forgotten Hollywood – Book Series in its 75+ branches. This is indeed exciting news! I would also like to thank the Sachem Public Library in Holbrook, NY (part of the Suffolk Cooperative Library System in Long Island) for adding a copy of my first paperback. 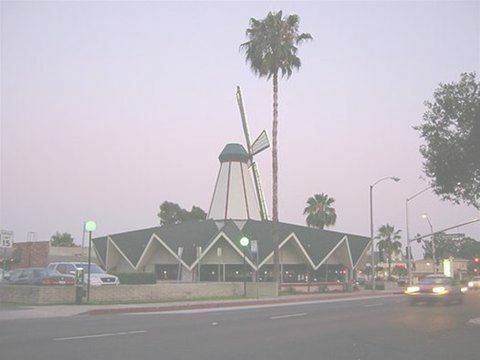 This is the sixth copy housed in the Cooperative, including Brentwood, East Hampton, Longwood, and West Islip branches; second most to the Los Angeles Public Library (9). 60 Libraries are sharing Forgotten Hollywood Forgotten History with readers across the United States, and one confirmed branch in Melbourne, Australia; along with countless others around the world! The tragic passing of Whitney Houston is expected to be devastating news for many generations of music lovers. As 2012 was unfolding, the pop singer was poised to make a comeback in cinema. Film production had just completed in the remake of Sparkle, and this musical is sure to help place Houston back on the pop charts. 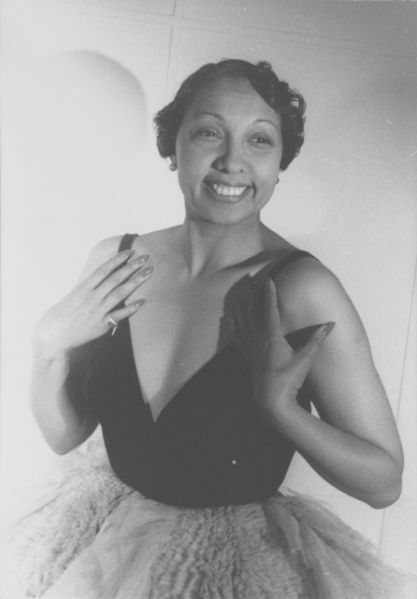 She also owned the movie rights and served as Executive Producer on the project, based on the 1976 story that mirrored the early career of The Supremes. 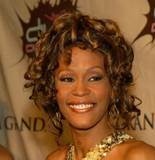 Primarily a singer, Whitney Houston had a sparse motion picture career. It included co-starring roles in The Bodyguard with Kevin Costner; and Waiting to Exhale with Angela Bassett and Gregory Hines. I prefer to remember The Preachers Wife with Denzel Washington. This movie was a remake of the 1947 classic, The Bishop’s Wife, which starred Cary Grant, David Niven, Loretta Young. The original also had a stellar supporting cast, including James Gleason, Elsa Lanchester, Monty Woolley, and Gladys Cooper. A Christmas-themed fantasy, Denzel and Whitney provided audiences with a rare delight that rivaled the original, five decades before. Though we can count the number of films Whitney made on one hand, it’s true proof of her complete talent that she could act almost as well as she could sing (at the peak of her career). I’m sure Sparkle will offer one more positive notch to her legacy. 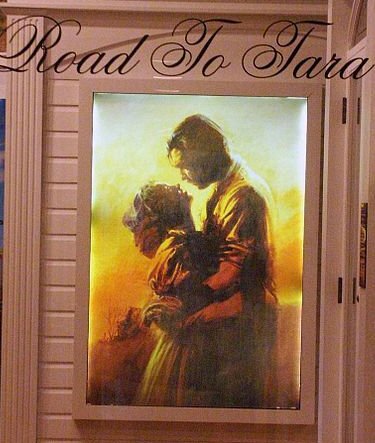 Officials at the Road to Tara Museum are reporting a fire that took place within a neighboring facility in Henry County, GA. The blaze was centered in the upper level of a storage unit. Directly below were units housing collectible posters from the 1939 premier of Gone With the Wind, promotional paintings, and other memorabilia. Firefighters are concerned about possible fire, smoke or water damage to all of the units. The event center museum, located just outside of Atlanta in Jonesboro, currently carries the most valuable artifacts in the collection, including costumes, a signed first-edition copy of the Margaret Mitchell-novel, and an original motion picture script. These prized possessions were not affected by the fire. Firefighters battled the blaze for several hours, and, fortunately, no one was injured. Our thoughts go out to the folks in the area. Several organizations that helped me promote Forgotten Hollywood Forgotten History have decided to show their support for Son of Forgotten Hollywood Forgotten History. My 2012 Book Tour has officially begun to commence, which is great news for those folks who want to purchase my latest work. Thank you to the Flintridge Bookstore and Coffeehouse, the Cypress Chamber of Commerce and the El Segundo Library for their unyielding confidence. The public is invited to all three events. As they say during any news cast… Bulletins as they break! I’d like to personally thank The Picture Show Man for promoting the Forgotten Hollywood-Book Series. 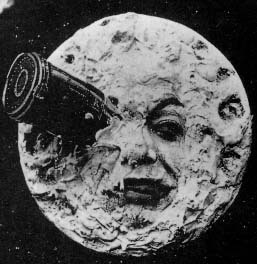 His website takes a comprehensive look at cinema from 1890 to 1960. 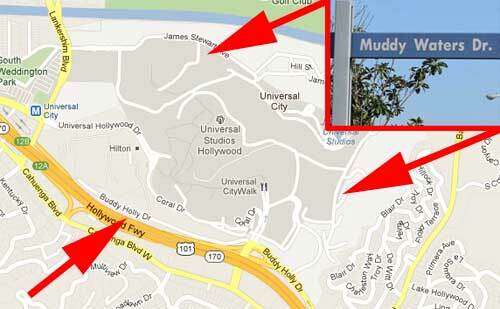 Universal City is the community surrounding Universal Studios and Universal Citywalk. Until recently, many of the streets were named after pop singer-icons. Geographic tributes to Patsy Cline, Buddy Holly, and Muddy Waters will be replaced by the names of legendary actors from Hollywood’s Golden Age. To compliment James Stewart Dr… Bob Hope Ave., Donald O’Connor Dr., and W.C. Fields Dr. will be the re-named roads leading to the historic movie studio. Community leaders made the savvy decision to change these street names in recognition of its largest commodity. The added bonus: Hollywood history is carefully immortalized in the city sitting along the cusp of Tinsel Town.